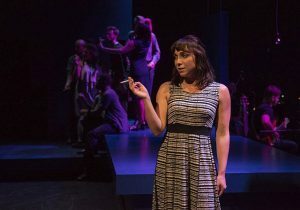 “Little Fish” is a musical adventure of a young woman’s journey to get her life on track as she leaves a bad relationship, gives up smoking and ultimately finds a core group of friends who are willing and able to support each other through life’s challenges. Even though I quit smoking thirty years ago I could still relate. I always tell people I wanted a cigarette for the first five years. So I understand how addiction to nicotine can make you crazy. The opening musical number grabs your attention and sets the tone immediately. It’s like a roadmap that lets you know where we are heading as the adventure begins. Nicole Laurenzi takes control of the stage the minute the lights come up and doesn’t let go for the next 90 minutes with no intermission. She and her voice are perfect for the role of Charlotte, an aspiring writer in New York City who is both vulnerable and determined. Her mission at first seems simply to quit smoking and to overcome the fact that she is average and ordinary. In the end she does not emerge as a beautiful swan but rather as a content, more confident human being who just wants some peace of mind and feeling of security. This is not a fairy princess story but rather a story the majority of people can relate to. Her gay male friend Marco (Adam Fane) suggests running. Marco gets the title song explaining the need for little fish to “swim in schools” or basically band together for support and for their own protection. Cinder (Teressa LaGamba) is Charlotte’s first NYC roommate and gets most of the comic relief in this production as she belts out a couple of the most emotionally energetic tunes. Robert (Jeff Meyer) is the smug know-it-all ex-boyfriend who appears in flashbacks voicing Charlotte’s insecurities and doubts as he reminds her that whatever she does will never be good enough. The addition of the young Anne Frank (Kyrie Courter) who appears in a dream is a very funny idea. “Little Fish” is entertaining and might more accurately be termed a modern opera. Bravo to Michael John LaChiusa who not only wrote the book but also the music and lyrics. No small task, which he accomplished brilliantly. 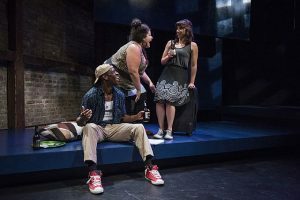 The story, loosely based on Deborah Eisenberg’s short stories “Flotsam” and “Days,” is well conceived and well executed but the star of this overachiever’s trinity is the music, an upbeat mix of jazz and pop rock with strong Latin rhythms. There is nothing here that will assault the senses or challenge anyone’s musical preferences. It has a kind of “old school” cabaret quality that is easy to listen to with easily articulated lyrics and a few memorable tunes. Carl Herzog as Mr. Bunder gets his Frank Sinatra groove on very effectively, as Charlotte’s smarmy boss offering a classic NYC vibe. Shout out to Kokandy Production’s six piece band conducted by Kory Danielson. The lack of an overture was a disappointment as I would like to hear more from them and it would have been nice to help us get in the mood. Arnel Sancianco ‘s minimal set design worked well even though director Allison Hendrix seemed to prefer to avoid using the center of the stage. The choreography was a miss for me as was the lighting. I realize this is a small space but the movements were cliché and not well executed bordering on comical at times and looking much like a high school production. An exception was the swimming sequences which were quite effective. The lighting or lack of lighting seemed arbitrary. Memorably, a tableau which might have been an opportunity for the lighting designer Alexander Ridgers to shine, literally left the actors in the dark. These are not deal killers and perhaps will improve over time. As a side note Kokandy Productions offered an interesting newsprint playbill but it lacked a list of songs and any background information about the creator Michael John LaChiusa which seems a major faux pas. Chicago’s premiere production of “Little Fish” is entertaining and makes me want to keep an eye out for future offering by LaChiusa. There are no big laughs and no great let downs. Much like Charlotte herself it is a safe and secure evening’s entertainment and ideal for lovers of cabaret style music. Details: “Little Fish” is at Theater Wit, 1229 W. Belmont Avenue in Chicago now through Aug. 20, 2017. For tickets and other information call (773) 975-8150 and visit Kokandy Productions.